Last week I was down in San Diego for another Radiology conference. After the conference, my buddy, Joel, and I decided to visit Joshua Tree National Park for the weekend. The Park is about a 3-½ hr drive northeast of San Diego, and offers some of the most beautiful desert landscape terrain in the world. In this blog, I’ll share with you my favorite shots from the short visit. 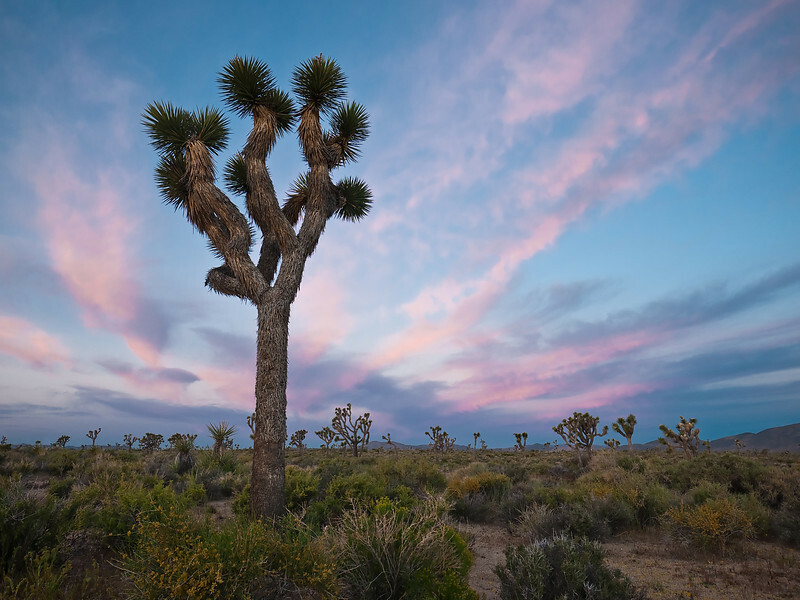 Home to picturesque, twisted trees and massive rock formations, Joshua Tree is sandwiched between the Mojave and Sonora Deserts. Joshua Tree National Monument was established in 1936, and the Desert Protection Act upgraded it to National Park status in 1994. We drove to Twentynine Palms, a gateway town to Joshua Tree, located just north of the park. As an interesting bit of information, this town is home to the largest Marine base in the world. We arrived late Friday afternoon and explored the park from the comfort of our air-conditioned car. When the outside temperature became more bearable, we took a nice stroll through the Hidden Valley nature trail, where we saw fascinating rock formations and labeled desert vegetation. Below is an image of a particularly interesting rock, which to me looks like the “Flying Elvis” logo found on the New England Patriot’s football helmets. We then headed up to Keys View. Unfortunately, the visibility was poor and much of the distant mountain ranges were obscured by haze. However, I did manage to capture an image of a photogenic lizard with a multi-colored underbelly, basking on a warm rock. That evening we headed over to the White Tank Campground and hiked the easy Arch Rock nature trail, where I captured the image below of Arch Rock. The next morning we awoke before sunrise and headed back into the park. The light was spectacular, and below are my attempts at capturing it. Later that morning, we found ourselves in the Cholla Cactus Garden capturing wildflowers and Teddy Bear Cholla cacti. While at the Cholla Cactus Garden, a long-eared denizen popped out to pay us a visit. She eyed us suspiciously for a few seconds, wiggled her nose, and hopped away. By 8 am the light was getting harsh, and we headed back to Twentynine Palms, grabbed some breakfast at a local diner, downloaded our images, and took a well-deserved nap. We awoke in the afternoon and headed back to Joshua Tree. Around 5 pm we began a moderate 3-mile hike up to Ryan Mountain where we ate dinner and photographed the sunset. We then headed down the trail with headlamps illuminating our path. On our way back to town, we pulled off the road to photograph star-trails. We watched a 1 hr 40 min movie on my iPad while our cameras captured the celestial movements above Joshua Tree. The opening image of this blog was the product of this long exposure. I combined one hundred consecutive 1-minute exposures. During the first minute of exposure, I used my headlamp to illuminate the foreground. The camera was set to manual exposure at f/4 and 60 seconds on “burst mode”. I attached a cable release and locked down the exposure button. The next morning we slept in, packed up and headed back to San Diego to catch a plane to Seattle. I hope you enjoyed these images and thanks for visiting! I went rock climbing here back in the early 90′s. Your photographs brought back memories of this beautiful place! Barb, thanks for the comment. It looks like you’ve been everywhere! I saw a few rock climbers and was wondering how hot it must be for them! Dude looks like you had a rockin time at J-Tree man! You’re 400mm is looking like its shooting sharp as well! Great landscapes as always bud! Linda, thanks! That little one is pretty cute, huh? Ray, thanks for the comment, bud! Ya, I got Henry’s 400. It’s a beaut! Tack sharp and in superb condition. Great shots! I’m curious as to how you managed to take that photo entitled: “Star Trails Over Joshua Tree, Panasonic GF-1 & Panasonic 7-14mm f/4” I noticed that the star streaks covered a span of about 26 degrees, and that amounts to just under 1 hour 45 minutes. I have a GF-1 and the bulb setting is limited to 256 seconds, just over 4 minutes or so. Were you able to bypass the GF-1’s 256 second limitation on the bulb setting by tweaking the firmware? Or did you take multiple exposures and merge them together. I’m very interested in how you took this photo since I’ve tried to get a similar shot with mine, but am getting frustrated with the bulb exposure limitation. I’m also curious how you overcame the 4 min bulb time.